If you’re one of us, the few holdouts who don’t have air conditioning, or if you just like the look in the photo above, try painting your window screens. Several beautiful creations, including the one seen above, were done by artist Bruce Marzahn, but the technique could be used by anyone. I saw the screens and other creations by Marzahn last year at his properties at 165 and 167 Prospect Ave., Buffalo, during Garden Walk Buffalo. Garden Walk Buffalo is the largest garden tour in the United States and will be held this year from 10 a.m. to 4 p.m. Saturday and Sunday, July 27 and 28. You can still sign up to show your garden on Garden Walk Buffalo; the entry deadline is May 15. 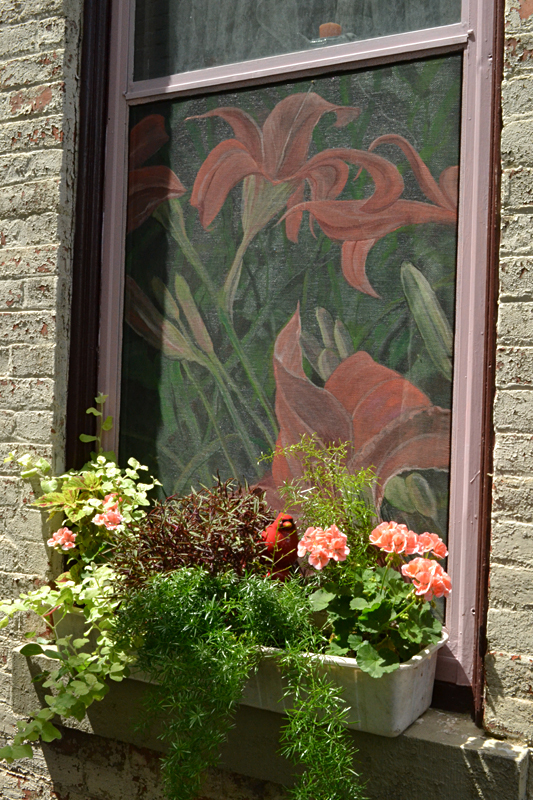 The painted window screens are an East Baltimore folk art tradition, said Marzahn, who is retired from teaching at Buffalo State College and Daemen College and also taught briefly at Canisius College. The screens were popular from the 1930s through the 1960s when people didn’t have air conditioning. To try to keep cool, you had to keep your windows open and your curtains pulled wide apart, but that left you with little privacy. Painting the window screens makes it difficult for people to see inside your home, but still allows breezes to drift in. The screens are decorative, too. Marzahn simply cut a piece of black plastic screen about four or five inches larger than the frame. He painted the flowers on the screens using inexpensive acrylic paint (the liquid kind, not the paint in a tube). When the paint was dry, he inserted the screen into the frame. After several years, the sun is fading the paint, he noted. If you have triple-track windows, you could remove the screen during the winter. While he identifies himself as a painter, Marzahn said he does more digital media now and is into outdoor living spaces. You can see the kitchen and entertainment area he built on a deck in his back yard. 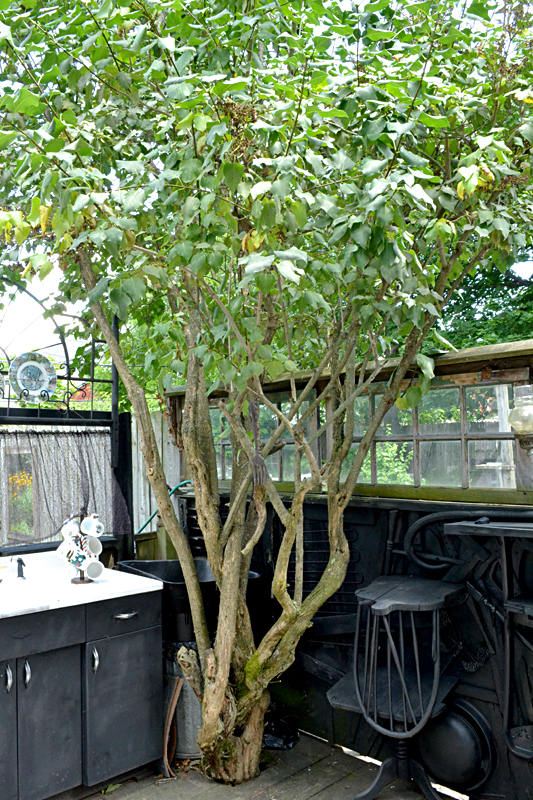 The deck was built around the lilac bush, which you can see in the photo above left. The sink, which you can see above right, actually works. It’s not high-tech; a hose supplies the water and the water drains into the ground. The sink came from an apartment that was being renovated, and the curtains and plates take it over the top. The wall, which you can see below left, is three-dimensional. Wooden chair backs, plastic chair backs, grates, hoses, decorative wood pieces and mechanical parts are collaged onto the wall. A coat of black paint helps gives the piece uniformity. Another collage was created in the concrete patio. 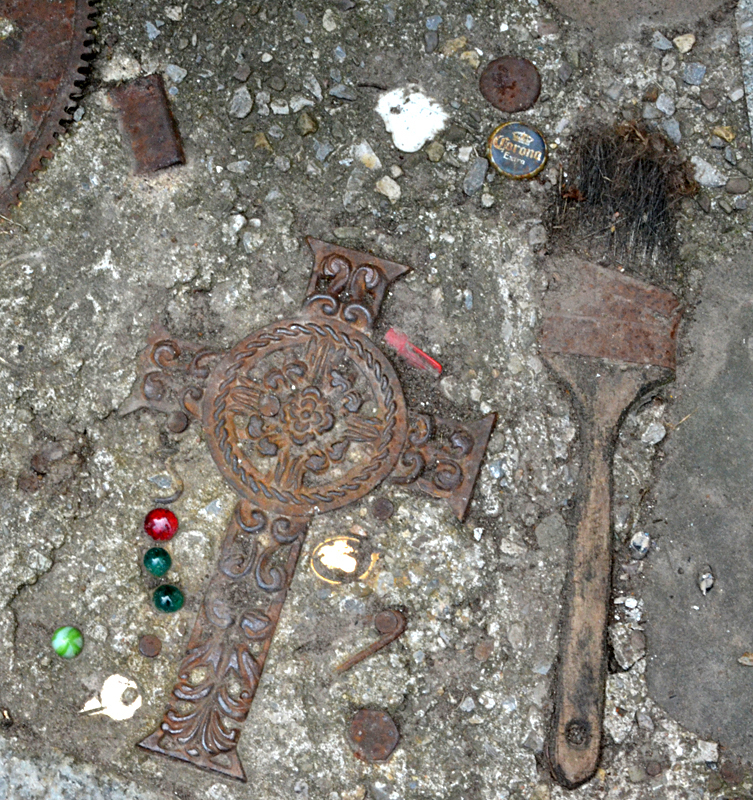 Objects pressed into the concrete include a brush too stiff to use, a metal cross, keys, machine parts, bottle caps, marbles, shells, spoons, perfume bottles, tools, small tiles, hinges and dice. 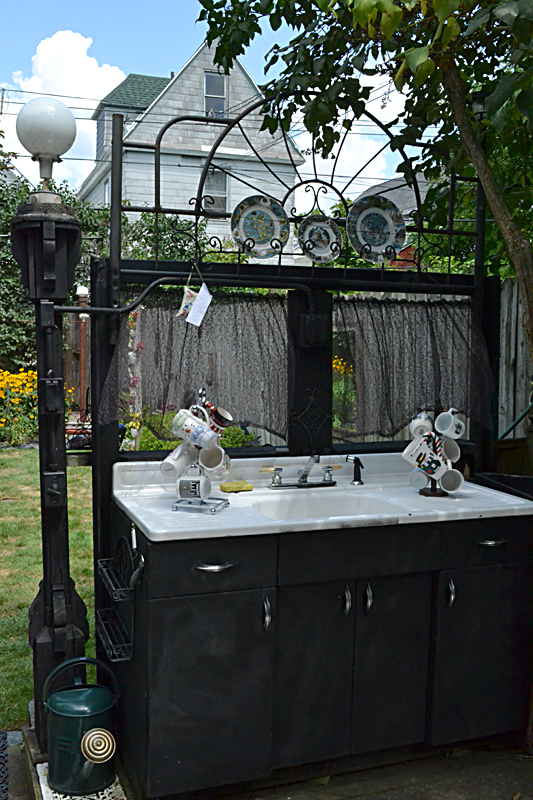 Take inspiration from Marzahn and get creative using found objects in your yard. Great job, Mr. Marzahan! I will have to be sure to check it out during this year’s Garden Walk. The environment created by Marzahn even seems to make cheeseburgers taste better. I remember seeing this very creative property and just love his screen painting. The lilies are wonderful. One of the amazing things about Bruce Marzahn is that his creativity knows no bounds. It simply continues to evolve in new directions. As always your artwork is phenominal and your ideas take ordinary to extraordinary. It seems you have so much fun with it too. Thanks for sharing and please continue sharing your talents. I know you two must make life in your neighborhood something to treasure by having such a beautiful home. If you have a large outdoor space, you can create both sitting and eating areas. By putting down a deck or perhaps enclosing the sitting and eating areas with a low wall, you can distinguish them from other areas, like the lawn. Also get here http://www.coloradogreenlandscaping.com/photo-gallery/patios/ ideas about patio and how to improve your outdoor space. You were such a unique artist in high school. Why am I not surprised at this wonderful variety of media! I used to garden and loved putting quirky and unexpected things around to surprise people and make them laugh or at least smile. Seems that you enjoy the element of surprise and fun as well. What an amazing gift! Wish I could see it in person. I’m sure it’s even more wonderful. Your work is absolutely lovely! I love to garden and it makes me happy to see what wonderful things you have added to your garden. My garden, although small, does contain a few surprises placed here and there just to make someone smile. Thank you so much for this lovely work. I also attended Anacostia back in the day but did not realize you were the same person. Please keep up your wonderful and beautiful work. Thanks for all of the comments. Glad to hear from you all. My wife Catherine has earned much credit for this as I am mostly the fabricator to her ideas. A pleasure to know you! Thanks for visiting the pages and leaving all of those commente. Thanks for visiting the pages and leaving all of those commentes.